I’m so excited to announce that my husband and I are expecting our very own baby next month! Pregnancy has been a joyful, humbling, scary, overwhelming and empowering experience all at once. I think the joy that comes with having a new baby is easy to understand. My husband and I were over the moon when we found out I was pregnant. 🙂 A little person to love and care for, and so many firsts and opportunities! I can’t help but to smile every time I think about holding my baby. It still seems surreal when for many years, I’ve sort of given up hope that I would ever become a mom. I haven’t shared this publicly before, but around the time of my Hashimoto’s diagnosis, before I had recovered my health, I had markers and symptoms of premature ovarian failure. I had night sweats, irregular menses, mood swings, as well as an elevated FSH (Follicle Stimulating Hormone: when elevated, this lab can indicate low ovarian reserve, premature ovarian failure or menopause). Premature ovarian failure (POF) can happen for a variety of reasons, two of which include radiation exposure, and an autoimmune response to ovaries. Premature ovarian failure means a woman goes into menopause earlier than expected and will likely struggle with ovulation and fertility. This was me in 2011. With my diagnosis of Hashimoto’s, all of the fatigue and health challenges I experienced as well as the signs and markers of POF, I was afraid that I wouldn’t be able to get pregnant and became used to the idea that a baby may never be in my future. Evidence is growing that premature ovarian failure is connected to autoimmune disease. Thyroid disorders are the most common co-occuring conditions with premature ovarian failure, and a deficiency in the hormone DHEA (associated with the adrenals, which are, in my experience, dysfunctional in 90 percent of people with Hashimoto’s) has also been connected. In addition to making all of the lifestyle changes to address my Hashimoto’s, I also spent about a year taking DHEA, an adrenal hormone supplement (often touted as the youth hormone) that has been clinically shown to reduce thyroid peroxidase antibodies and address premature ovarian failure. I took the actual DHEA supplement and the 7-Keto version as well. Please note: DHEA and 7-Keto, while available over the counter in some countries, are potent hormones. Women generally benefit from lower doses, anywhere from 1-30 mg per day, and may experience adverse reactions such as skin breakouts. This hormone can turn into estrogen in the body, so it’s not indicated for people with a history of estrogen fueled tumors. I’ve written about this hormone in my two books, Hashimoto’s: The Root Cause and Hashimoto’s Protocol, but due to some of the risks, I recommend working with a practitioner when taking it. I have been ovulating regularly since 2012 and all of my remaining symptoms of POF vanished over time! I was able to get Hashimoto’s in remission in 2013. The lifestyle changes you’re making for Hashimoto’s are going to help your body become healthier overall. Fertility (during childbearing years) is a sign of health, and the healthier you are, the easier for you it will be to conceive and have a healthy pregnancy! 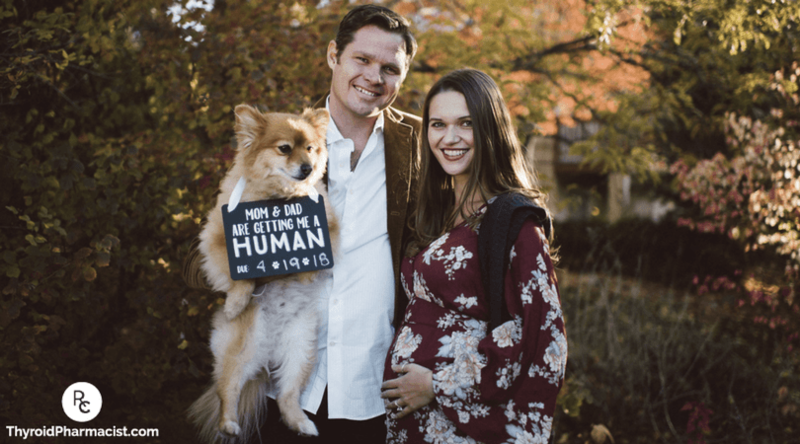 I never even had a chance to retest my FSH and do a “proper” fertility prep – but since everything I’ve been doing for years for Hashimoto’s tends to increase fertility naturally, I went into the pregnancy pretty healthy! If you’ve struggled with fertility issues, please know that there are answers out there. Getting your TSH under 2 μIU/mL, reducing your thyroid antibodies under 100 IU/ml, cutting out reactive foods like gluten or dairy, taking LDN, DHEA, and/or optimizing your luteal phase with progesterone and adrenal support, acupuncture and numerous other interventions can help you become a mama, if that’s one of your dreams. Don’t give up hope! (Also, if you have other health struggles because of your Hashimoto’s, hang in there, and know that I am here to help – that is really my life’s purpose). I’ll share some of my favorite books and resources on fertility and pregnancy at the bottom of this post. We live in a world of so many choices. While I’m well versed in optimizing fertility by ways of addressing Hashimoto’s, I am not an expert in pregnancy, babies or childcare. Even setting up my baby registry was overwhelming. I wanted to know not just which products were going to be the most helpful, but also, how safe were the products? Luckily, I had some great friends to ask, as well as the WellnessMama and MamaNatural blogs to use for guidance. 🙂 If you want to see what I ultimately registered for, here is my Amazon Registry Link. In addition to the usual overwhelm and fears that most pregnant women face, such as “Will I be a good mom?”, “Will my baby be healthy?”, “Which preschool should I choose?”… (I woke up one night at 3am looking up preschools :-))… I ended up having a few scary situations, where I was worried about my little bundle of joy. In the beginning of my second trimester, I caught a virus while visiting the hospital to have some prenatal tests done. I was bedridden for almost 3 weeks with numerous symptoms. It was either the killer cold (Adenovirus) or the flu. Either way, it wasn’t fun, and I felt helpless, because I couldn’t take my usual antiviral remedies, as many of them weren’t tested during pregnancy and/or can have potential adverse effects in pregnancy. I worried about my little one the entire time. Plus, being sick for three weeks meant that I got behind on numerous projects and my baby book reading! I’ve also had quite a few personal setbacks occur throughout my pregnancy that I was not expecting. At the time that they were happening, I felt very stressed and wondered if it was fair of me to bring a child into the world and if I was truly ready for the challenge of being the main person responsible for caring for a little one. I’ve been able to overcome the setbacks, shed my past self, let go of childish beliefs, and no longer accept things that don’t work for me. In a way, these challenges have become opportunities for growth, as well as for becoming stronger and more empowered. I’ve become much more grounded through the process and more committed to getting my needs met. While patience and compassion have always been a core part of my personality that I loved, they sometimes got me in trouble, because I would put others’ feelings before my own needs. Throughout the pregnancy, my belief in myself has greatly increased, while my tolerance for people who do not treat me well has greatly diminished! 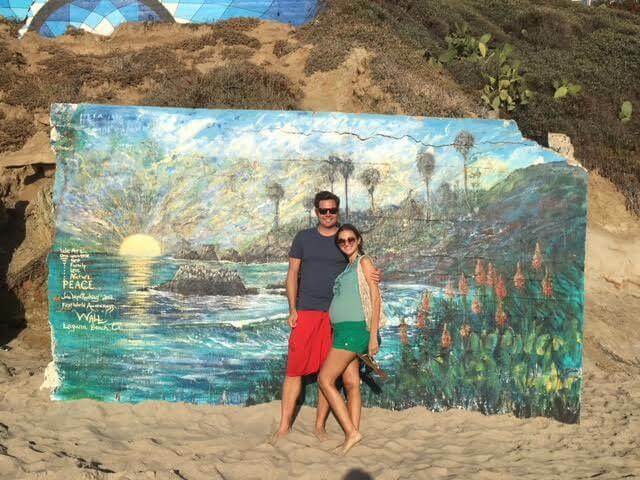 Speaking of growth… The pregnancy has given me an even deeper appreciation for my body! It has been so amazing to watch my body change and grow to create a little human. Some days I feel like a fertility goddess with my rosy cheeks and full belly, other days like humpty-dumpty with my swollen feet and slight waddle! Just starting to show at 12 weeks! Our official pregnancy announcement photo! 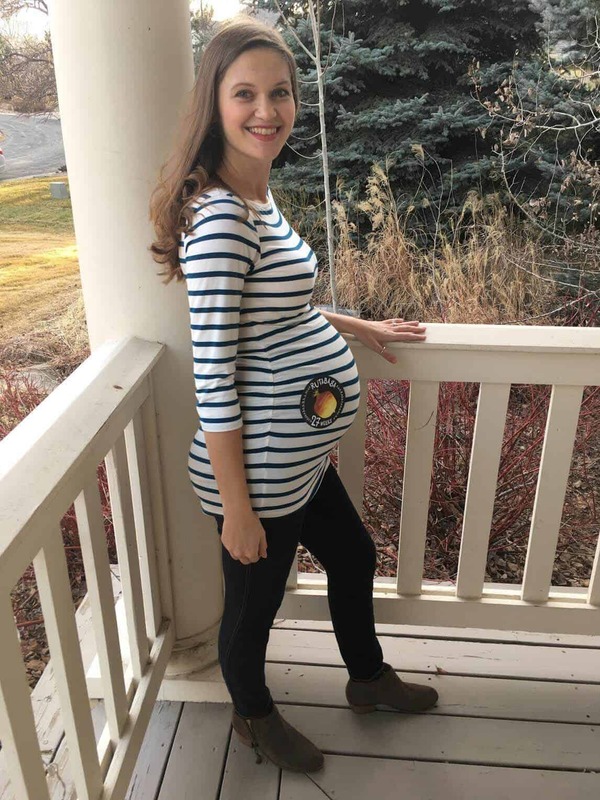 Chillin’ in Colorado at 28 weeks! I am so grateful to be healthy enough to become pregnant, and I’ve had a pretty healthy pregnancy so far, but I still feel pregnant and have had many of the “typical” pregnancy symptoms. I’m discovering and learning new things everyday, and I’d like to share some of my research, as well as a few of my personal observations with you, with the hope that they may help you or someone you know. 1. Increasing your thyroid medications – It’s been well documented that women who become pregnant will need to increase their dose of thyroid medications by about 30 percent as soon as they become pregnant. This is the first thing I did when I found out I was pregnant. 🙂 Be sure to work with your doctor. Getting on the right dose of medicine can prevent not just thyroid symptoms but even miscarriage! Read more about lab tests for pregnancy in this post. 2. Your immune system is not as vigilant to infections when you are pregnant, so you are more likely to pick up any germs that are going around. In one sense, this is a good thing – if the immune system was overactive, it would recognize the baby as a foreign invader. (As a side note, this does happen for some women with autoimmune disease and can lead to miscarriage – LDN and other immune modulation strategies such as Wobenzym may help). On the other hand, this could be a bad thing, as infections can be risky to you and the growing baby. I mentioned that I became really sick towards the beginning of my 2nd trimester. I picked up the bug while visiting my local hospital lab for prenatal testing! The lab waiting room is attached to an emergency waiting room where little sick kids were coughing and sneezing while I was waiting to get my blood drawn. Since that time, I’ve elected to get my labs drawn elsewhere. Look for options like your physician’s office, a mobile phlebotomist or a small standalone lab. Additionally, you may want to use a face mask when you are in public places with a lot of germs like hospitals and schools. I’ve had a couple of other instances of morning sickness, either on days when I forgot to take my P5P supplement, or on days when I had to give a talk or an interview. Let’s just say… I take the P5P every day now and I put my speaking engagements on hold for a little bit in favor of nesting! My hubby and I joked that #BossBaby (as we have been calling our little one) has already made demands for me to change my schedule. The dose used in studies is 50 mg-500 mg (6), and I personally take 50 mg per day. 4. Food Sensitivities can cause acid reflux in pregnancy! Acid reflux was one of my major symptoms that bothered me for almost 3 years, then it went away when I removed reactive foods. I haven’t had an incident of acid reflux since then, until the end of my first trimester. Before I was pregnant, I had introduced most foods back in to my diet, with the exception of gluten and dairy (as well as nuts, which caused me to have chin breakouts), and had no symptoms. But somewhere along the pregnancy, I started to have almost daily acid reflux! I tried some gentle remedies like ginger, magnesium and drinking more bone broth – to no avail. I asked around quite a bit, and many experts told me that acid reflux just came with the territory! On a hunch, I decided to repeat food sensitivity testing, which revealed that I had a few new food sensitivities! One of them was ginger, a common anti-reflux remedy recommended for pregnant women. I cut out the ginger as well as the other foods that came up positive on the test, and guess what? No more reflux 🙂 (with the exception of the times I accidentally ate the reactive foods). You can read more about the food sensitivity test I use in the article on Food Sensitivities. 5. Magnesium is truly a miracle in pregnancy! It has helped me with getting better sleep, reducing leg cramps and constipation. I use the magnesium citrate version. 6. Perioral dermatitis without antibiotics – Perioral dermatitis is a facial rash that seems to be connected to hormonal changes and one that many pregnant women get. I had this rash many years ago when I was taking birth control pills, and had used multiple rounds of antibiotics to clear it. I had another flare up of perioral dermatitis during the pregnancy and was able to clear it by using Calendula-Comfrey Salve and by addressing iron deficiency. Some of my colleagues also recommend looking into non-SLS toothpaste (Carol Messere), B2 deficiency and fungal cheilitis (Shawn Tassone), Zinc deficiency (Carolyn Messere), topical Vitamin E, fluoride-free toothpaste and water, and food sensitivity elimination (Shannon Morgenstern), to address perioral dermatitis. 7. Iron deficiency can cause many “pregnancy” symptoms like brain fog, dizziness, insomnia, fatigue and restless leg syndrome. Often times, these symptoms are dismissed as normal pregnancy symptoms. 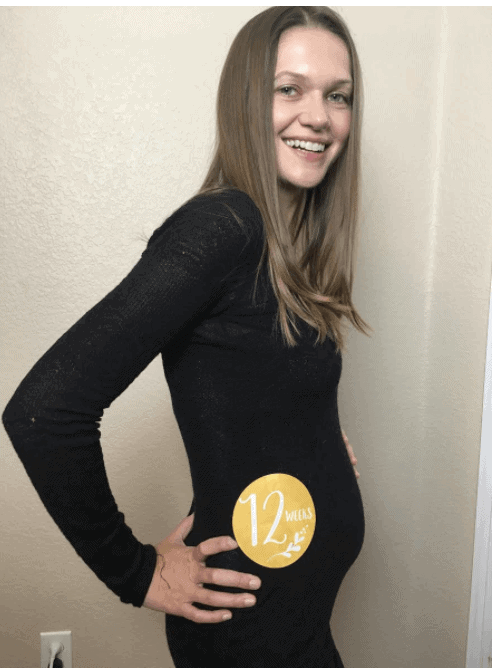 When I first became pregnant, I checked my ferritin levels and found they were deficient, so I decided to get iron infusions right away to address the low levels quickly. While I still had the 1st trimester fatigue (thanks to a big surge of progesterone which helped to prepare the nest for my baby and made me so relaxed, but so sleepy), my mood was really happy and mellow. However, towards the middle of the second trimester, I started becoming emotional and having serious burger cravings! My husband and I dubbed this my “burger deficiency” and I had to eat 2 burgers a day to stay calm and happy. There may have been a time or two where he had to go out in rush hour traffic to get me burgers so I would stop sobbing… While the burgers were grass-fed, gluten-free and delicious, they weren’t enough for the high iron demand the pregnancy caused, and neither were the supplements I was taking. As time went on, I started to feel worse emotionally, eventually having crying spells, anxiety attacks, overwhelm, insomnia, significant fatigue and even restless leg syndrome that no amount of burgers could resolve. I self-ordered my ferritin and iron labs earlier than recommended by my doctors, and found that I was deficient in iron once more! I began to feel more like myself with each iron IV, and rather quickly, my emotions stabilized, and the anxiety, overwhelm and insomnia went away. The restless leg was gone after the first IV. The fatigue improved, though I am still not as energetic as while I’m not pregnant, so the fatigue either comes with the territory indeed, or I just haven’t figured out what to do about it! But, I’m grateful to be free of the other symptoms and I am getting my sleep! Pregnancy and childbirth are both known to deplete iron levels. In people with a history of iron deficiency, this could be more significant… I will be exploring the mechanisms of why I became somewhat deficient after the baby is born and when I’m back to my guinea-pigging ways. For now, I will continue to receive iron IV’s and test my nutrient levels throughout pregnancy and in the postpartum period. The moral here: you may become deficient in iron/ferritin as soon as you get pregnant, and earlier than the average woman, especially if you have a history of low ferritin. You may not absorb iron properly from food, no matter how many burgers you eat and you may not even absorb enough of it from supplements. Iron IV’s are an important option you should know about! 8. Leg cramps – I haven’t found a magic bullet solution for this, but getting my iron levels up, taking magnesium supplements, epsom salt baths, and Arnica cream, as well as using compression stockings, keeping hydrated, doing prenatal yoga and drinking green juices seem to help. Taking care of a little one? Healing yourself while you have a little one? If you’re thinking about having little ones, I hope this information has helped. If you’d like to see pictures of my little one, I’ll be posting them on Instagram! Ayesha, Jha V, Goswami D. Premature Ovarian Failure: An Association with Autoimmune Diseases. J Clin Diagn Res. 2016;10(10):QC10-QC12. Mamas L, Mamas E. Premature ovarian failure and dehydroepiandrosterone. Fertil Steril. 2009;91(2):644-6. doi: 10.1016/j.fertnstert.2007.11.055. Barad D, Brill H, Gleicher N. Update on the use of dehydroepiandrosterone supplementation among women with diminished ovarian function. J Assist Reprod Genet. 2007;24(12):629-34. Fusi FM, Ferrario M, Bosisio C, Arnoldi M, Zanga L. DHEA supplementation positively affects spontaneous pregnancies in women with diminished ovarian function. Gynecol Endocrinol. 2013;29(10):940-3. doi: 10.3109/09513590.2013.819087. Shrim A, Boskovic R, Maltepe C, Navios Y, Garcia-Bournissen F, Koren G. Pregnancy outcome following use of large doses of vitamin B6 in the first trimester. J Obstet Gynaecol. 2006;26(8):749-51. So happy for you!!!! And gorgeous in your photos!!! Keeping you in my prayers!!! Congratulations! So happy for you both. Wish I had had some of this info earlier. My daughter-in-law just delivered our second grandchild on March 9. She suffered from morning/all day sickness the whole pregnancy. Thanks for sharing now. I will keep it since they may want more….or I’ll have it if someone else may need it. Know you will be exceptional parents….so exciting! Love and blessings! What a beautiful surprise! It could not happen to a much more loving, caring and beautiful spirit. So happy for you and your husband!!!! soooo happy for you! May the rest of this tri-mester go well and the journey of motherhood be met with joy and blessings. Thank you for sharing so much of your journey and research. This is good news, all the best for you and the baby! Thanks for the always helpful information, you rock!!! Congratulations!! You look beautiful and wish you and your husband the best! Prayers for healthy mommy and baby and successful breastfeeding. This is great news! So happy to hear and you look so beautiful. I had most of my kids at planned home birth with midwives (5 kids)– feel free to contact me for any questions and what to look out for if giving birth in the hospital. Just as you know —most doctors are not too helpful in assisting and preventing problems so that you can have a natural delivery—so you need to be totally proactive and vocal. Congratulations to both your husband and you! 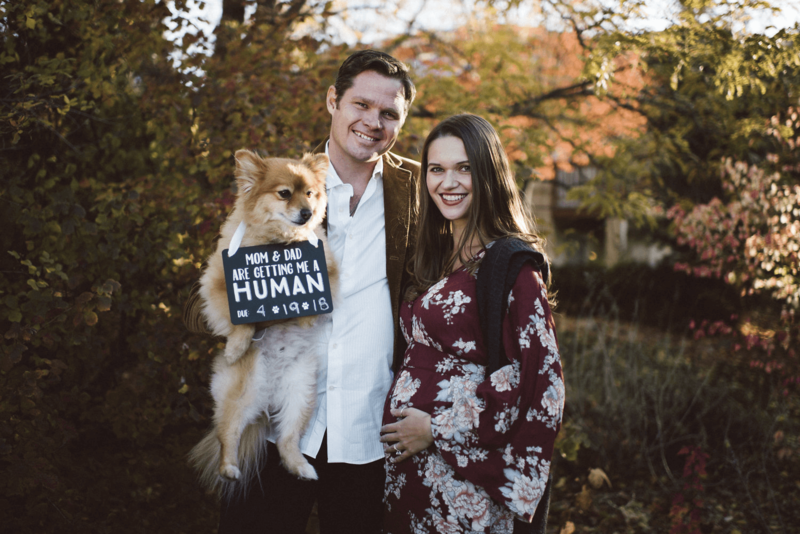 You’re going to make great parents! So conscientious. God bless you and your growing family! I’m so glad I found your website, you’ll never know how much it’s made a difference for me. Thanks again! Congratulations! Very exciting news. I wish you the best in your final months of pregnancy and a smooth transition into motherhood. It’s the best and hardest job in the world! You are looking SO healthy and pregnancy suits you!! Big congratulations to you and your lovely husband. I wish you a safe and good delivery of your baby and I know that you are in for a life time of joy with your new wee one!! You life will never be the same!! I am SO happy for you Dr Wentz and thank you for sharing so much with so many of us. We are all very blessed ❤️. Angela – thank you so very much! Jacki – thank you so very much! So happy for you . Wishing you continued health with the pregnancy. Patricia – thank you so very much! I am so glad about your pregnancy! Congratulations to both of you. Let us know wheh the baby is arrived. Anaëlle – thank you so very much! Congratulations Dr. Izabella! You continue to be such an inspiration. Thank you for your honesty and openness about your pregnancy. Speaking your truth about autoimmunity and pregnancy only continues to empower those of us women who have been through it or are hoping to go through it. I had four pregnancies with Hashimoto’s. One ended in miscarriage due to (what I personally feel) was a mismanagement of thyroid meds by my dr. I have 3 beautiful children. The more we know and learn, the better mommies we can be. Cheers to you and your hubby! Congratulations Isabella, I am so happy for you! You will be a great Mom! Congratulations! Growing and nurturing a family is life’s greatest blessing. Per me. 😄 …even with all the uncontrollables! Congratulations! Very excited for you as I was with Christa! You are a beautiful Mom and will be just fine. Trust yourself that you know more than you think! How nice to hear this happy news! I hope everything will be fine. Kisses. Do you have any advice on women with Hashimotos and Hyperemesis? I really would love to have another baby but I had Hyperemesis so bad that I am scared now that I have hashimotos also I may not make it through another pregnancy. Omg! That is so exciting. Wishing you all the best. And you will be a great mom. Never doubt that. So glad you got your desire!! I pray you will both be very healthy. I had my first baby 65 years ago !! Thanks for all the info you shared especially about the low ferritin symptoms. My 13 year old is taking the pill form of ferritin as she was very low. I didn’t realize insomnia, restless legs, and anxiety were part of the symptoms related to that. That makes sense. Congratulations! I’m a little confused by your comment on increasing medication was one of the first things you did, I didn’t think you were on medication anymore? I will keep you and your growing baby in my thoughts and prayers. You are such an inspiration to so many women. Luck for me, I had three beautiful children before my immune system got totally whacked out. Congratulations. What a wonderful give you are receiving. The universe has definitely blessed you and your caring heart with an additional opportunity to expand your horizons! Cant wait to hear more. oops…What a wonderful GIFT you are receiving! Catt – thank you so very much! Congratulations Izabella! Wish you all the very best. Zita – thank you so very much! yeah!!!!! happy for u Doc Wentz. God is good. Congratulations and Enjoy! I am so very happy to hear of your good news! This blessing is returned to you for how richly you have been an instrument in blessing others. Its not always an easy path but so worth it! I hope that you and your husband (and your cute doggie from the picture!) as well as your all of your relatives enjoy the newest member of your family and I’m sure you all will! God Bless! Over the moon excited for your new Joy that will be a blessing for a lifetime!!! Thank you for all your valuable help in the Thyroid world!! Julie – thank you so very much! <3 I appreciate all your support! Wonderful news! I have never seen you look so happy 🙂 Congratulations to you both! Congratulations Dr. Wentz!! After all you and your husband have been through, you are receiving a wonderful blessing! Congrats!!! I am expecting as well, due in May. Like you, I was worried that I would face fertility issues, but following the guidance in your books helped me get my health on track. I have the best thyroid levels that I’ve had in 10 years and have so far had a completely healthy pregnancy. Thanks for sharing your story and helping so many of us get our health back! I am very happy for you 😃😃😃😃😃😃! Congrats Dr. Isabella and your husband. 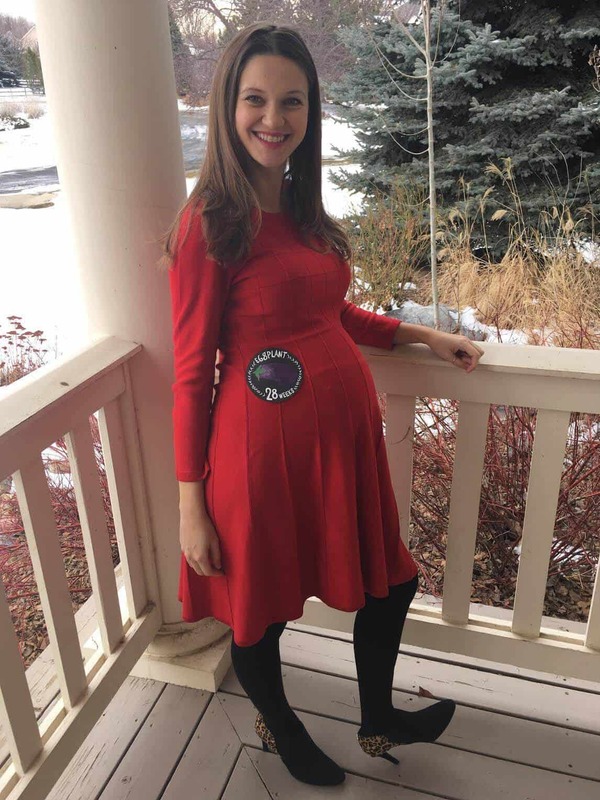 What blessed, exciting news–to be part of the circle of life, and the miracle of birth! And there’s the miracle of human development to be part of too. My first grandbaby is nearly a year old. What a delight! Congratulations. Your readers are very happy for you. Please keep us posted with pics. Thank you for all of your advice. Kay – Thank you so much! <3 I will keep you posted. 4/19/18! It’s so close!! Enjoy every step! Congratulations!! Really excited for you both. So thrilled for you, hope all goes well for the rest of your pregnancy and birth. Today is Mothers’ Day in Ireland! Barbara – Thank you so much! <3 You are so sweet! What a wonderful blessing. You have done so much to help others you deserve much joy and happiness. Loved the picture at 34 weeks! You are a beauty inside and out! Congratulations. So happy for you. Been with you for awhile and glad to see your dreams come true. Congraulations!! You will be so blessed and so will your child! I am so very happy for you! It has been wonderful getting to know you through the internet, your books, etc. It’s like I am sharing happiness with a friend. Barbara – thank you so much for your kind words and support! What delightful news! Thanks for sharing so that others might benefit from your experience. Although I wasn’t diagnosed with Hashi’s until just after my third pregnancy, I still struggled with 24 hr. morning sickness which worsened each time. Too late for me, I learned that a simultaneous combo of Vitamin K1 and Vit C was very successful in eliminating nausea. 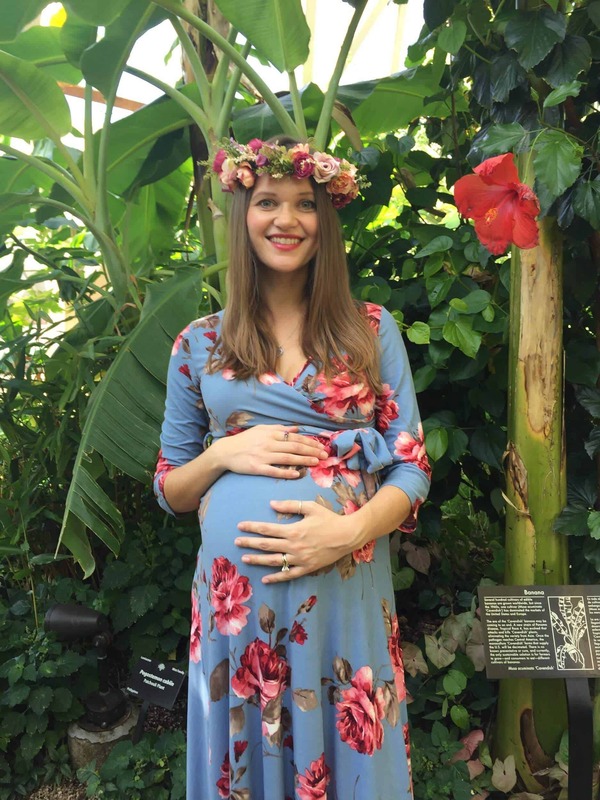 (see https://nutritionandhealing.com/2011/11/10/beat-morning-sickness-naturally/) Towards the end of my third pregnancy, I developed preeclampsia. I was on Nature-Throid (and needed that increased as my pregnancy progressed), but now believe that I may have had a magnesium deficiency which predisposed me to developing that condition. As for after baby arrives, sleep when baby sleeps! It’s tempting to get everything done when they aren’t awake, but you will run out of gas. I tracked how much time I sat nursing and it’s an 8+ hr. job at the start. By the time my third baby started solids, I was gluten free due to Hashi’s so I did the grain-free GAPS baby diet with him, using a lot of natural liver sausage and cooked veggies pureed together. He loved it. Keep dating your husband. Children change everything. 🙂 Hope the above can make someone’s pregnancy easier. Congrats ! Thanks for sharing your wonderful news!! Congratulations! You are a bright light and deserve all the best. I’m in my second pregnancy and am so excited and feeling SO good! I am on no prescriptions, I take WHOLE food supplements and self medicate with desiccated beef thyroid for my thyroid issues due to radiation (I was previously on armour but would not recommend at all now that I have been on a whole food version–desiccated GRASS FED beef thyroid!). I am not anyway connected to this blog but find her content 100% on point. For pregnant ladies this is a must read! It is so exciting that your pregnancy is going so well! It was great to meet you in Denver at the Functional Medicine Conference last fall. Take care & Wishing You Well on your delivery. Dr Nancy Russell in Kansas City! Congratulations on your pregnancy. I am not pregnant, but I have found apple cider vinegar to be very effective for stopping foot and leg cramps. Just drink a teaspoon of ACV in some water and the cramps go away almost instantly. I hope it works for you. Allie – Thank you so much! <3 I appreciated your tips! I have been trying for almost 4 years, no success yet. Quick question: were you taking your Rootcology Adrenal Support while trying to conceive? I was taking Adrenal support from another brand but stopped as I was worried any ingredient was or could cause unknown fertility issues. Andrea – thank you so much! <3 I wish I could give you more direct advice but, each person will react differently. I would advise you to ask your personal pharmacist or a trusted clinician who’s care you are under. I am not able to respond directly to these types of questions here. Dr Karl – thank you so much! I appreciate your kind words and support! Congrats on your new addition and thank you for all of the great info in your books! Congratulations! I am excited to hear about your baby! So happy for you and your husband!! Your books and articles have been so helpful to me. My mother was recently diagnosed with Hashimoto’s also. And my 20 year old daughter has elevated thyroid antibodies, so everything you share is so much appreciated! Tere – Thank you so much! <3 I appreciate all your kind words and support! Congrats dr Wentz. Exited for you, thank you for sharing. Thank you for sharing all of your information you have thus far to help us become healthier! (Without all of the hype…and videos that go on forever until they get to the point and then want to sell you something). Blessings to you and your husband and your lucky little one! That’s terrific news! Congratulations! You mentioned getting antibodies down to under 100 as pregnancy prep; what happens at the 100+ mark? I am so excited for you. What a priceless God given miracle you are receiving. From one woman with Hashimotos’ to another…congratulations and many blessings! I am so very happy for you and your husband. I wanted to do this as natural as possible so I took the Lamaze childbirth training and recommend this training. I was able to give birth both times with minimal medical interference; no induction, no drugs. I breastfed both of my sons for many months (even though no one else in my family ever had so no help or guidance available there.) I read books and connected with the La Lache League and this group helped me tremendously. I just also believed that I would be able to feed my babies this way, to trust in my body to do the job that nature had built me to do and I was fine. Yes, there were challenges that had to be overcome (a bought of painful mastitis) that I worked my way through. My sons both thrived and my pregnancy and birthing experiences were memorable and I thrived as well. Maybe I was lucky, but I like to think instead I was prepared. Best of luck on your journey and enjoy the ride! I am so happy for you and your husband! I pray that your new child brings all the joy and personal growth that raising a child has to offer! Congratulations to you, your husband and also your puppy dog who will now have a little 2 legged playmate. All the best. Congrats Dr Wentz. I’m glad you chose life even with your set backs. I pray your sweetie will come in this world safe and sound. Very happy for you! I was hoping to see you pregnant one day. Praying for the next month to go smoothly as you prepare to meet baby. I plan to share this article with some friends. What great news!!!! I’m beyond thrilled for you and your husband! I thank God for the gifts he has given you! I thank you for sharing your gifts and so much of your life journey, which has helped so many. May God greatly bless this precious one! Congratulations and Blessings to you and your husband for your new bundle of joy! I have a question about the Iron IV. Can a GP give them or only Functional/Naturopath doctors? How do I request one if my ferritin is low and not my overall Iron levels, which are somewhat high? Is the IV a Ferritin IV? Thank you for your time and may you have a beautiful delivery and beautiful healthy baby! Wow, that is so wonderful! You are adorable!! Many blessings to you and your husband and baby. New life is such a gift. Congratulations Dr. Wentz! I am so happy for you and your husband! What a lucky baby to have you! Thank you for sharing with us on more personal side as well as invaluable resources. Have a beautiful and peaceful birth, enjoy this very special time. Can’t wait to hear from you once you settle into motherhood a little. Congratulations, Dr. Wentz! What exciting news–and how thoughtful of you to incorporate so much helpful information in your “announcement” article. Thank you for all you do. Best wishes as you bring your little #BossBaby into the world. For leg cramps, apparently potassium will help, but the magic thing (I know it’s full of sugar…) but tonic water, a little every day, will efficiently prevent the cramps. I read somewhere it was due to its quinine content. I wish you a happy childbirth! OMG! I knew it! I’ve delivered babies for half my life and usually have a 6th sense about these things. I had a feeling every time I read a post but was waiting for the announcement! Bethany – thank you so much! I’ll add breastfeeding to my list of future article possibilities. I would love to hear more about your experiences here on this page! Be prepared for postpartum to potentially be a particularly emotional roller coaster ride thanks to your thyroid having to settle back into “normal”. For your cramps, I suggest trying a mix of magnesium and potassium. The potassium did the trick for me. Congratulations Izabella!! I am so happy for you and your husband. My daughter is also due at the end of April, April 26th to be exact. Thank you so much for all that you do, and all your great advice! My daughter has been having the acid reflux, and we just thought it was due to the pregnancy, so thank you for providing the info on getting tested for food sensitivites! Awesome that you knew to increase your thyroid dose and got DHEA to help and more. This baby is a gift from God and God guiding you to learn what was needed to help. LDN during pregnancy is awesome help to block hidden gluten. It is saving my life. No gluten may help people get pregnant along with vitamins/minerals/good oils. Prenatal vitamins don’t have the good oils and are low in dose. Progesterone helps the umbilical cord stay there. Zn/Mg are great help. Osteoprocare is what I use instead of dairy. I wish I had gone to the chiropractor early in the pregnancy to get my back in alignment so labor would be easily. When my thyroid was going down in my 2nd pregnancy I got a blood clot in my leg and labor/breast feeding hurt more. They never checked my thyroid. I had two babies in a row and breast fed then and didn’t know I was Celiac so already low in nutrients. My first son was high strung and my 2nd son was ADD due to low nutrients/good oils. After my 2nd pregnancy I was weak and could hardly lift the baby due to low thyroid. I did not get thyroid medicine until he was 4 months old when I went to the doctor and said I think my thyroid stopped. I got Synthroid only which doesn’t work hardly without Zn/Se/enough iron/probiotic. I stopped dairy age 40 when I got seizures/depression etc and stopped gluten age 50. I would have loved to go through pregnancy again knowing what I know now which would have helped the babies be healthy/happy/strong. I had post depression after my 2nd son was born due to low thyroid/low nutrients which caused low oxygen in my brain/body. I also can’t have ginger. It is like Vit C and thins blood. Spirulina is like a whole food and may help in pregnancy. Detoxing needs to be done before pregnancy. Sea salt with 22 minutes may help restore low good minerals after detoxing. This is what I do: No gluten/dairy/soy/sugar/GMO/food with a label…take vitamins/good oils/minerals…probiotic…LDN..detox. Zn/Mg/fish 2000mg/evening primrose oil 200mg/lecithin 2000mg/phosphatidylserine/DMAE/CLA/Vit C/Vit A/Vit E/B vitamins (Pure brand- coenzymated kind)/Nature’s plus- Source of life multiple/rhodiola/coenyzme Q10/Osteoprocare/HCl and enzymes with meals/Orthobiotic or Cytoflora before a meal/Vit B12 methylcobalamin with intrinsic factor and folate/Vit D3/Sunlight/exercise (walk)/good water/lay on couch for back support and side support. Acupuncturist in my area helped pregnancies be very healthy…mom and baby thrived. Yes…B vitamins may help morning sickness and no gluten. I stopped vitamins when my baby was born and breast fed without them. I had no money to buy them. That was not a good idea. Breast feeding may help a baby be ok with vaccines. But vaccines are too young/too many at one time/too many total and bad ingredients and may not help and may hurt. Hept B vaccine at 12 hours old may destroy the brain/body and 7-8 vaccines at one time may cause crib death and some die or become disabled or Autistic (mostly boys). Vit K shot at birth may also hurt and is not needed. My chiropractor had good liquid vitamins for a baby. Eggs/fish may help the brain. Antibiotic free kind and healthy kind. Lecithin may help the brain/memory. Baby formula maybe 1/2 sugar and GMO corn/GMO soy which may hurt the immune system/gut lining/block thyroid. Breast milk from self or other healthy person/pumping may help. My breast milk got less when my thyroid went down. I wish I had know the vitamins/minerals back then I needed to keep my thyroid strong. Vit A/Vit B12/Zn/Se/enough iron/strong probiotic/Fe and more may help. I went to the chiropractor who had a dark field microscope and my blood was daisy shape after my 2nd pregnancy (needed fish oil and other good oils) and had fat in my blood (liver needed defating…with lecithin) and I saw yeast. This was 2 years after the delivery when the hospital said my blood looked strange, but they didn’t say what to do to about it. Vit C helps skin be more elastic to stretch back into place. Protein helps energy. Nature’s plus- Pea Protein/cage free, antibiotic free, organic fed eggs which I poach help me. Raw walnuts (open shells to avoid hidden gluten and freeze so fresh help my brain.) Organic/vegetables/organic low sugar fruit/mushrooms help me now. I drink tea now, but I don’t know if that would upset a baby. Gluten/pizza made colic in the baby when I was breast feeding. My baby only moved when I stopped moving. My 2nd baby almost never moved. Low thyroid in the first trimester may cause a baby to be breech. I was breech and no energy/almost a miscarriage and cord may have been around my neck when they moved me to be born right. 2000mg of fish oil daily stopped my colds/flu for more than 20 years and that was before I was gluten free. Antibiotics hurt the mitochondria/gut lining/lower Mg/wipe out good bacteria in the large intestines/lower the immune system/can become resistant to them. Avoid chemicals/paint/drugs/vaccines/with with a label. Cravings tell what you are low in. I craved dairy/meat, but once a twinky which is not healthy. Play cello/piano/talk to the baby in the womb and they may want to play these instruments. Take care/God bless! I am glad you are smart/wise in helping yourself. May God be with you the whole pregnancy and afterwards. Happiness…. YAY!! CONGRATULATIONS.. SO EXCITED FOR YOU AND YOUR FAMILY!! 🙂 I too have Hashimoto’s and am 29 weeks and 5 days pregnant with my second child. I’m due in May. on May 16th, 2018. We are having another boy. 🙂 Congratulations again so excited for you!! Congratulations Dr. Wentz!I am so happy to hear your exciting news!! You are going to be a great mother. You have so tirelessly given to people that you don’t even know over the years. I have read your books and followed your protocols and had successfully brought my antibodies into the remission level! However, I was very upset to see that my anti-thyroglobulin levels shot up to 1500 and anti-tpo to 75 immediately after becoming pregnant. I had never seen these antibodies so high in my life! I am hopeful that I can get them down following your protocols once again after I give birth, but I would love to see a future post about this topic. Best of luck to you! Alison – thank you so much! I wish you the best of luck as well! <3 Pregnancy can often be a trigger for developing Hashimoto's or for an autoimmune flare – iron deficiency and immune shift, as well as potentially the baby’s thyroid cells that circulate in the body, may be a trigger. You might find these articles interesting. 1st off congrats!!! How exciting. 2nd, I can completely relate to the burgers. I was the same way pregnant with my 3rd who I was really anemic with as well; however, I didn’t know until delivery. I want to share what helped me postpartum with the anemia was placenta encapsulation- my iron replenished greatly by taking the pills. I felt a huge difference with no significant postpartum fatigue like I had with my 2 prior kids; I only encapsulated with my 3rd. It truly was remarkable & my blood work showed the improvements as well. Good luck. Congratulations on your pregnancy! I am so very happy for you! Becoming a mother is such a wonderful blessing. I have 3 children and six grandchildren that make me so happy! I love reading all your information and books. You are so kind to share your knowledge. I know you will be a wonderful mom to your little one! My first was a SAD baby and second was an AIP plus reintros baby. First I had HG and second I didn’t so wonder about the AIP link there… I was also iron deficient with my second pregnancy and had to get an IV in the start of the third trimester. Potassium on top of the other things you mentioned helped with my leg cramps. So very happy for you Izabella! What wonderful news! Wishing you all the best in your delivery. Congratulations on your pregnancy Izabella. What lovely news. I am a women’s health Physiotherapist and find that giving pregnant women calf stretches to do before bed drastically helps decrease calf cramps. Hope you find that helpful. Congrats! You’ll be very happy with your little one as I am after mine was born a year ago! I’m pretty sure you’ll be a great mom! Don’t worry! Congratulations, Izabella! This is indeed an answer to prayers! I’m SO happy for you! I found the Classical Stretch pregnancy workout really helpful for aches and pain in general and leg cramps and swelling in the legs and feet in particular. Huge Congratulations you look wonderfully radiant! Congratulations! You deserve all of the happiness that motherhood will bring. I’m thrilled for you and your husband! So Happy for you and hubby, it is a great experience, keep us posted. This is funny because I am currently 27 weeks pregnant with thyroid disease & I kept thinking “Surely Izabella is going to get pregnant soon so she can write me a guide on thyroid stuff for pregnancy & postpartum…” Perfect timing! I, too, believe that pregnancy ‘symptoms’ are mostly deficiencies. Aside from the fatigue – that just comes with the extra physical work your body is doing in the background by building a baby. Ive had both Graves & Hashis diagnosis, I currently tend to sit on the lower end of the “acceptable” ranges. I saw a naturopath when I was really ill with thyroid symptoms & tested at almost zero iodine. Since taking 145mcg potassium iodide daily, I can function normally again, my ThyroglobulinAb is down to 13, AntiTPO down to 98 (AntiTPO won’t budge ay lower for some reason) & my TRAB is down to ZERO. During pregnancy, I have had tired moments with borderline low iron so Ive have had to include extra iron with my prenatal vitamin. But also what made a big difference was, again, increasing my iodine. I now take 365mcg of potassium iodide daily. The iodide improved my sleep, woke me up during the day & definitely made a massive improvement to my mood. Ive had monthly thyroid tests so far during the pregnancy & everything has remained stable. I do feel pretty nervous about postpartum thyroiditis as both my sister & my mother suffered it – hopefully you can give us some tips on how to avoid that? I don’t know that much about it, Ive just assumed I won’t be able to avoid it. Thanks for the tips. Congrats on your little one. My wife and I were about to give up. We both have thyroid issues. After 15 years, we considered fostering or adopting a child, and then it happened – Sara got pregnant! That was in 1995, and Kathryn was born on June 25, 1996, and what a blessing it has been – she got married in June this year, and we’re expecting to become grandparents in July!! I pray that God will bless you and yours in like manner. Cornie – awe that is such a beautiful story! Thank you so much for your support and prayers! Congratulations on such an exciting journey ahead of you being a mother. I was first diagnosed with hashimoto after a miscarriage 2 years ago. It has been a roller-coaster journey of emotions and different issues but now I can say I am enjoying being a mum to a 9 month old. Krill oil cured my indigestion/gastritis of first trimester, along with apple cider vinegar. Oil pulling with coconut oil cured my sore & bleeding gums. Magnesium is heaven sent for sleep & belly cramps. I am so happy for you and your husband!!! You are truly glowing, and pregnancy is a sacred time for a woman so enjoy every moment of it. I am at home with the flu, but your story and pictures sure put a smile on my face! I enjoy your postings and have learned a tremendous amount about thyroid disease which runs in my family. THANK YOU for the work that you do!! Congratulations Izabella! I started reading Hoshimotos protocol six weeks ago. I am a 61 yr. old mother of 11 children now all grown, and I cannot put into words the joy my children have brought into mine, and my husbands life. I did pray for you to conceive and am overjoyed for you. Let me know if you need any advice if you plan on breastfeeding as I am a Lactation specialist in Texas. Carol – thank you so much! <3 I appreciate your prayers and support! I'm looking forward to seeing your progress here as well. Congratulation Dr.Izabella Wentz. I am very happy for you. You look great…..beautiful….all best to you and your husband. We will never forget you….we love you. I am so happy for you and your husband! A huge congratulations! You have so much to look forward to. You look absolutely wonderful pregnant! I am so very happy for you and your husband! You have helped so many in dealing with Hashimotos and often it feels like nothing woll feel normal. What an answer to prayer, your lil bundle will be. I will lift you and baby up in prayer for an easy birth and energy youve never known to be the mama youve longed to be. Many congratulations on your new found fertility!! I know you will be an awesome mom because, 1. You want to be. And 2. You are such a caring individual. I had my only baby almost 50 years ago. There was no information on childbearing, breast feeding, or infant care available to me at that time. All gynecologists were male. They believed that natural childbirth & breast feeding, like “health food,” and chiropractors were “Witch Craft,” as my Dr. put it. Functional medicine wasn’t even heard of yet. Women learn from their mother’s or friends who had already had babies. I had an extremely controlling and abuseve mother and I wanted her out of the picture. My husband was also a controlling abuser. (of course, that was all I knew at that time in my life.) He wouldn’t allow me to have friends. I was very isolated. So, I went through pregnancy, childbirth and rearing alone. Even though I had many inherited & undiagnosed autoimmune diseases and detox issues, and laten infections (Lyme and Epstein Barr.) within my body. Thank you so much for all your knowledge and support in my healing. You mean so much to me and many others. Love and blessings to you, your baby and your family. You look fantastic. Congratulations to You and your Husband. Wish you healthy baby and more good books that you are sharing. Thank You! You never gave up and that why your wish has come true! I am so happy for you and your hubby and you will be a wonderful mother and enjoy the gift of motherhood. You have done all you could to prepare for this now nature will do the rest. I am so glad for you, Izabella! And a little bit sad. My time didn’t come yet! But THANK YOU for sharing your experience and all this helpful knowledge, it gives me and many others strong hopes of getting good health and healthy babies! Let your baby bring you and your husband a lot of joy and happiness! I am very happy for you! I think I must be a bit psychic because a couple of days I go I was thinking that the only topic you hadn’t covered was pregnancy and that I bet it wouldn’t be too long before you had a baby because you are just about the right age to start thinking about that. I am also wanting to have another baby but worried about it because of age & hashimotos. Wishing you the best of luck and thank you for all your work which has changed my life and helped me enormously. Charlotte – thank you so much! I appreciate your support and sharing your journey. Pregnancy can often be a trigger for developing Hashimoto’s or for an autoimmune flare – iron deficiency and immune shift, as well as potentially the baby’s thyroid cells that circulate in the body, may be a trigger. You might find these articles interesting. Congratulations! I’m sure you’re going to be wonderful parents and that your dog will be thrilled with the new arrivial. Good luck on your new exciting journey. Congratulations to you both. Thank you for your advice and guidance all the time. I very much appreciate everything you write about. Congratulations on such wonderful news! And thank you for all the info you have given us on Hashimotos. One of the best sources out there! Please be careful with iron infusions, better to raise hemoglobin levels naturally (nettle, liver – natural vit A ok, chlorophyll etc.) Similar to any other supplements where natural form is better (ex. brewer’s yeast or bee pollen for B vitamins). Ferritin is not the best measurement of iron levels, neither is blood, iron could be deeply hidden elsewhere and not utilized. Best to go with Hemoglobin levels. I am so happy for you and your husband. This is joyful news for sure. Good journeys always in your life. I’m curious… I thought you didn’t take thyroid medication. Then, what does “to put your Hashimoto’s into remission” mean? To be simply without symptoms? Thanks! Thank you so much Dr Wentz! Anik – you are very welcome! This is such exciting news and you look absolutely stunning! This is a massive gleam of hope for many of us. Thank you so much for having such a passion for helping others! I’m wondering if you have any insight on a struggle I’ve been dealing with that relates to this article. I have low testosterone and DHEA. When I supplement with either, I find that any area of my body that struggles with chronic pain and inflammation quickly increases in pain 10-fold (primarily my hips and pelvic region) and takes weeks to get back under control after removing the supplement. It’s quite unbearable. I do take LDN daily which is what I believe has made my pain generally otherwise manageable. I’ve tried super low doses of DHEA with the hope of working my dosage up but no luck. Is this common? Is there a different, more effective way I can increase my DHEA that would be less likely to affect me so negatively? I too, dream of having a baby and at 36 I feel like my window is quickly closing. Kristin – thank you so much for sharing! I wish I could give you more direct advice but, each person will react differently. I would advise you to ask your trusted clinician who’s care you are under. I am not able to respond directly to these types of questions here. I highly recommend that you work with a functional medicine clinician to be a part of your own health care team. It’s an entire medical specialty dedicated to finding and treating underlying root causes and prevent serious chronic disease rather than treating individual disease symptoms. This is wonderful news!!!! Enjoy this time…it flies faster then you could ever imagine! Blessings to you all! This is SO AWESOME! So happy for you. What a blessing. Truly inspired. After adopting many lifestyle changes, I’ve found immense symptom relief in my early twenties 🙂 Cheers. Congratulations Dr Wentz and wish you much health and happiness! I was just recently diagnosed with Hashi’s (TPO at 2000) after a m/c so your blog, books and your story have been truly inspirational and a lifesaver. I appreciate it greatly, keep up the good work. Congratulations!! I am sooooo excited for you. Thanks for sharing photos and information about getting pregnant with Hashimoto’s! Congratulations Dr. Izabella and family! You look absolutely beautiful! Thank you very much for sharing your story and wonderful news. I too feared not being able to have children after my Hashimoto’s diagnosis, and my menstrual cycle was completely absent for a year before I got pregnant fall 2015. I got pregnant the one and only time I ovulated the entire year, and it happened to be within a few months of starting acupuncture for my Hashimoto’s and getting my medications right. It truly felt like a miracle (and an amazing surprise). My son is now one and a half, and wow, being his mom has been the absolute best (and hardest) experience. Being a parent is an absolute joy. I’m sure you’ll be a wonderful mom. Wishing you a healthy and as comfortable as possible rest of your pregnancy and of course a perfect delivery. Sending much love and joy your way! Oh! I also wanted to share a website that was an amazing resource when I was new to breastfeeding and had a million questions. https://kellymom.com/ It was recommended to me by my lactation consultant, and I can’t count the number of times I visited the site in the first months of nursing and going back to work. It’s a learning curve for both you and baby, but once you have it down, it will be a piece of cake and a very special experience for you and baby. I will warn you though that the first couple of weeks can be really hard, but don’t give up! My little guy had a lip tie and a tongue tie that made things really hard at first. We got them resolved by a pediatric dentist, and after that, breastfeeding was smooth sailing. I am excited to hear about your pregnancy and congratulation. I to am a first-time mom and am 8 weeks along. One thing I struggle the most is knowing what vitamins and supplements to take while pregnant. I have battled Hashimotos for two years now and your book really helped me regain my life. If you could offer any advice on prenatal vitamins and any other supplements that are good for pregnancy I would greatly appreciate it. Congratulations!! It took my husband and I several years of trying and luckily were successful after two rounds of chlomed. Our son is now three and we have been trying for baby number two before the big 40. It has been a struggle get the thyroid back on track since then. Thank you for sharing your journey and wisdom and giving us hope to keep fighting. Best wishes for an easy, healthy delivery. Congratulations! I am so happy for you and your husband. Thank-you for sharing your news, and for posting the lovely pictures of you at different stages of your pregnancy. You have been blessed with a deserving gift, and rightly so! Also, my sincere thanks for helping me through my journey with Hashimotos. I’ve learnt so much from the HSMC: you have been so thorough and generous with your knowledge, materials and support. Words can’t quite express just how I feel in my heart. I am forever grateful for having found you. Again, thank-you. Dear Izabella, I so appreciate your mission to help others who struggle with hypothyroid and related issues! I don’t know you, but you are truly likeable even through your emails. I’m thrilled that you are able to have a baby. I couldn’t get pregnant before my hypothyroid was diagnosed and it was such a joy when we finally did! Keep enjoying the journey! And thank you for all you do. I’m sure you will be a great mom because you clearly know how to love well. Enjoy! Sherri – thank you so very much! <3 Congratulations on your new baby as well! Congratulations! Pregnancy is a blessing!! My husband and I were on our journey for 5 1/2 years before we ended up trying IVF. With luck, it worked! And, it was a breeze – also a blessing. I just gave birth to my son 2 months ago, healthy pregnancy, healthy son. I feel incredibly lucky. One thing I did in preparation for birth was a combination of flower essences. I’ve used them for other issues in the past with incredible success, and birth was no exception. I’m the first woman in my family to have a vaginal birth with no complications for generations, my family has only come into the world through c-sections, which I had been told since childhood would be my fate as well. I chose to have a midwife and to deliver at a birth center, in hopes I would have the support I needed for a natural birth. These decisions and the flower essences I chose, I have no doubt, enabled me to have a birth just like I imagined, hoped and prayed for. My other tidbit of advice, if you end up going past your due date, consider a tincture to nudge you into labor like blue & black cohosh, AND, something I never heard of before, is a Foley catheter. My midwife suggested one when I was one week past my due date and it got me into mild labor. With the tincture and a nice long romantic walk with my husband, I went into labor two days later and had the baby the next morning. My other bit of advice, if you can, labor at home for as long as possible before traveling to the birth center or hospital (unless you’re already planning a home birth). … That said, do what feels right in the moment. Best wishes for your final month, and for an easy birth and a healthy baby! Andrea – thank you so much for sharing your journey with me! I love the wonderful advice and appreciate your support as well. Congratulations on the birth of your sweet baby! Congratulations, may we always only have good news! Congrats!!! and you are due on my daughter’s birthday… my last baby i had in 2010… before i was diagnosed with Hashimotos i had 3 children and i felt the best when i was pregnant. Now i know why!!! So so exciting!!! CONGRATS! I too have Hashimoto’s and am due 4.17 – we are almost due date twins! We tried a year and a half to get pregnant, worked with an acupuncturist to help with some hormone imbalances, and ended up needing to get some uterine polyps surgically removed, then were finally pregnant just a couple weeks later! I have a question that I haven’t known who to ask. Since our children are more prone to autoimmune disease/thyroid issues, do you have any thoughts on health and prevention for them? Such as: Do I let my kid eat gluten when introducing solids? Thanks for any thoughts! And congrats again! Jane – thank you so much! Congratulations on the birth of your twins! I appreciate you sharing your journey here. I do suggest that you work with a functional medicine doctor that is familiar in working with children (I only works with adults). I hope this helps! Congratulations Izabella & hubby! You have such a big heart you will be really great parents. Thank you for all your help to millions of people who suffer from thyroid illness. Believe me even many doctors and natural health doctors don’t have a clue how to control thyroid illness or cure them. You have been a really big help to me. I have been spreading your name around to anyone who needs help. Your are an amazing and much needed health advocate. Pam – thank you so much! I appreciate your kind words and support! You are so sweet to share my research, thank you! <3 I'm looking forward to seeing your progress here. Congratulations, Izabella! That is so wonderful! I just wanted to thank you for writing The Root Cause; I found your book in 2013 just after my diagnosis and it changed my life. I don’t think I would have been able to heal from the multitude of health conditions that emerged during my poor Hashimoto’s treatment if I hadn’t found your book, or have had the courage to keep trying failure after failure with different doctors, thyroid medications, etc. I am 36 years old and 11 weeks pregnant now, and I don’t think this would have been possible without your support. I am so happy for you! I agree with Heidi – you have done so much to help others you deserve so much joy and happiness. God bless you and your family! Dear Dr.Isabella! You and Krista Orecchio are role models for me and I often read your blog, but have not visited it for a long time. I also have Hashimoto and wish to become pregnant as well. And today, after a long break in visiting this site, I decided to open it with the idea that “Isabella must have become pregnant.” And wow, I see this post. This is a great joy! – Did you take thyroxine during pregnancy or NDT? – What is the recommended dosage of iodine in pregnancy with Hashimoto? -Were you taking iron supplements in the first trimester too? In what dosage? I read that in the first trimester there are restrictions on the intake of iron. -Did you have additional progesterone support? I embrace you and are sincerely happy for you! Wish you happy motherhood! CONGRATULATIONS Dr. Wentz! May you have a healthy and safe delivery and may God bless you in your new journey as a mom. Best wishes always! Thanks for all the help you provide all of us with thyroid problems. I have your two books and they have been of great help to me. Congratulations, you look so beautiful, wishing you the best! It is amazing to see you taking such a good care of yourself and at the same time, giving your precious time to others by reaching out and helping them to make the best pregnancy experience possible. Your baby is very lucky to have a mum like you! On the side note, I’d like to mention the book that helped me personally to parent my daughter to the best of my abilities, and which perhaps might help others, too. Oh this gives me hope! I’m reading your Hashimoto’s Protocol book and eating it up! Thank you so much for writing it! Erin – thank you so much! <3 I appreciate your support! I’m looking forward to hearing your progress on this page. Make sure to take the book slow, take notes, highlight, and establish a baseline when making changes. Here are some articles you might find helpful as well. Thank you for posting! I have a two month old and just read my almost same experience. Infertility, Hashimotos, iron/ferritin deficiency and inability to absorb properly leading to infusions, leg cramps. I’ve also been unable to breastfeed due to low milk production. My TSH and hemoglobin are WNL, but hemoglobin was really low immediately after delivery. Two iron infusions in the past two months. Such a frustrating journey, but thankful for our healthy baby! Kathryn – thank you for following this page. Congratulations on your new baby! <3 Pregnancy can often be a trigger for developing Hashimoto's or for an autoimmune flare – iron deficiency and immune shift, as well as potentially the baby’s thyroid cells that circulate in the body, may be a trigger. Progesterone deficiency can surge into Th-1 dominance. This explains why the one of the peak onsets of Hashimoto’s occurs after pregnancy, when a rapid drop in progesterone occurs after the delivery. You might find these articles interesting. May I ask a quick question? What is the normal rage for TSH, T3, Free T3, Free T4 and T4 for a pregnant lady. I just wanted to know as a reference. Congratulations! Can you recommend specific prenatal vitamins that would be sufficient in folate, gluten free, etc? Hi Dr. Wentz! When you got an iron infusion, was it Venofer, or is there another brand that is better than that? Izabella, dear one, you are absolutely glowing and growing. Your husband is full of joy and anticipation. This beautiful child will know how much they were wanted and love from the beginning. And, you have no idea how many babies will be coming into the world, healthy babies, healthy moms because you have poured out your heart to all of us!! The Bible tells us repeatedly how all children are a gift from God. Every single life, every single child, is a reward and blessing. Be encouraged by the following Bible verses about children and how the Lord sees them! God bless you Izabella. Can’t wait to see this precious child. wow.. got tears in my eyes reading your news, seeing your photos and made me say out loud ‘you go girl’ when I saw the sassy heels with leopard skin detail! Reading many of these messages, peoples stories, how amazing, loving. Thank for your service, endless hard work, sharing your journey for others to find a little light and direction. Can’t wait to meet the little one, well at least via your photos! I lost a baby at 17 weeks this past November. It was my fourth pregnancy and second second trimester loss (I have two healthy baby boys – 1 & 3 pregnancies – and have lost two girls in the second trimester – 2& 4 pregnancies). Anyways, the first loss was thought to be the cord so no tests were run until this past loss. We found out I had elevated TPO antibodies – the only abnormal lab. So we’ve had me on levothyroxine for three months and are trying to conceive again but just ran numbers the other day and I’m scared about how high the antibodies are now!! Don’t know what to do to decrease them so will be studying your blog! Best of luck with your precious one and delivery coming up!! Janie – thank you so much! I appreciate you sharing your journey! I’m looking forward to seeing your progress here. The most common triggers in Hashimoto’s are: nutrient deficiencies, food sensitivities, intestinal permeability (leaky gut), stress, an impaired ability to get rid of toxins and in some cases, infections. Optimizing your health starts with food. Figuring out which foods nourish you, and which ones cause you harm is the single most important thing you can learn in your health journey. Reactive foods trigger an inflammatory response in the GI tract, leading to malabsorption of nutrients (gluten sensitivity in particular has been implicated in causing a Selenium deficiency, a well known risk factor for Hashimoto’s), and can also produce intestinal permeability whenever they are eaten. I am so thrilled for you & Michael to be fulfilling your dream of bringing a child into your lives and into the world! When I was pregnant with my only child a friend told me that her doctor advised her that growing a baby inside you is like doing hard physical labor all day long, and that’s why we get so tired! I do believe that it does, indeed, go with territory. I pray that your baby will be a good sleeper and you will be able to get your much needed rest! I scrolled down hoping for exactly this kind of news. Hot off the press! So happy for you. It will be hard but worth it. 🙂 Take care of yourselves and enjoy every minute. I love his name, too! Congratulations on your beautiful girl. Do most women who take LDN stay on it the entire pregnancy and post-partum? Or do people wean off at a certain point in pregnancy? Slade – thank you! I wish I could give you more direct advice but, each person will react differently. I would advise you to ask your trusted clinician who’s care you are under. It would not be legal or appropriate for me to give any type of medical advice here. Have you checked out this article? Congratulations on your baby boy! I just want to thank you for your books. My doctor gave me the first book to read and it gave me a lot of insight but was confused by a lot of the readings. I think I have had Hashimoto’s for a LONG time but was just diagnosed June 1st of this year by my GP. Trying to decide if I should see an endocrinologist or not. I have gone gluten free, dairy free, alcohol free, sugar free, working on caffeine free bur struggling on what to eat. Have never been a big vegetables eater. Trying also to figure out supplements to take. Do you ever speak anywhere? I am truly inspired by you! I know stress in my life is HUGE factor. I am a worrier also! Sandy – thank you so much! I appreciate your support and kind words. <3 I do speak at conferences and you can find my videos on youtube, however, at this time I am on maternity leave. Having Hashimoto’s can feel very stressful. Having out of range thyroid hormones, adrenal fatigue, negative food sensitivities and low nutrient levels can lead to feelings of anxiety, hopelessness, and stress. Treating these issues one at a time is the best plan of action. You can recover and regain your health! My new book Hashimoto’s Protocol is a step by step guide to the interventions that helped 80% of the people 80% of the time. I hope you check it out. Firstly, hello from New Zealand!! Secondly, I want to say thank you! I have read both of your books and they have been super informative and helped me on my Hashimoto’s journey. I was diagnosed with Hashi’s in June (TSH was 76, T3&T4 were all over the shop and TPO >1000! Here they don’t tell you an exact number if your over 1000, so very not helpful when you’re looking for improvement!) I’ve been on thyroxine (50mcg daily) since being diagnosed and on supplements- zinc, selenium, D3 and B vitamins along with many other suggestions you make in your books. All is grand, my symptoms are pretty much non-existent, my TSH is 2.9 (getting there!) and my T3&T4 are all back to normal. My issue is these TPO antibodies! Still over 1000! I’m 36, married to a great man and we want to get the baby making (first baby squeeee!!) happening, but I’m super worried about the antibodies. I’ve seen two GPs and a fertility specialist and they all tell me not to worry about it and jump on in. I’m feeling very hesitant about these antibodies being so high and as you’ve outlined in this article they should be under 100. How long (is a piece of string) until my antibodies improve if I’m doing all the right things? Should I hold off or is it safe to jump in? This is an amazing story. Do you maybe have any articles about brrastfeeding and Hashimoto’s please? I had my first baby on the 10th and I am struggling with the milk production. Also never thought I will be a mommy one day. Congrats Dr.Wentz!! Loved your pics and thank you for sharing. Is it safe to take TDAP during pregnancy (third trimester) for women having Hashimto’s or is it better to take right after birth? Will it cause thyroid antibodies to flare up and harm the baby (still birth)? Dips – Congratulations! Thank you for reaching out. <3 Unfortunately I cannot give you any straightforward guidance about vaccinations and we each have to make our own informed decision about this. As a pharmacist, I certainly think that vaccines can save lives. I can also tell you that there's no drug on the market that doesn't have any side effects. It's quite plausible that a vaccine, which introduces a foreign invader and an infection, even though it's a deactivated infection, could set off the immune system in the person with the right genetic predispositions and perhaps some other things going on within their body that can trigger autoimmune disease through a mechanism known as molecular mimicry. Molecular mimicry is an autoimmune theory that states we develop autoimmune disease because there's a bug or an infection within our body that looks like our thyroid or another part of our body. The immune system starts to attack the infection and anything that looks like it. Now, it's possible that some of the vaccines, and particularly some of the inactivated infections within the vaccines, might look like the thyroid gland or they might look like another part of our body. There have been some studies suggesting that there was a connection between vaccines and other types of autoimmune condition in older times and some of these vaccines were removed off the market. There was one study done by Kaiser Permanente regarding the HPV vaccine, which looked at different types of signals that might suggest that a person may develop an autoimmune condition after the vaccine. They actually did see higher rates of Hashimoto's with the HPV vaccine statistically. Here is an article you may find helpful as well.